Today we are going to learn from another servant of God who calls on Yahweh's Everlasting Name. It is not to say that only these servants of God call on Yahweh's Name. I specifically chose these men of God because they put a specific FOCUS on the EVERLASTING nature of God's Name when they call on Yahweh's Name. This is David’s prayer after Nathan the prophet told him that God will make David’s name great, like the names of the greatest men on earth (2 Sam 7:9). What would your response be if God desires to make your name great like all the great men on this earth? Isn't this the kind of success many people are looking for in this world? What is David’s response? His response shows that he is truly a man of God. David doesn't want to hear about having his name being great. All David cares about is God’s Name much more than his own, "And let Your Name be magnified FOREVER...."
Seriously, ask yourself now: what is more important to you? Your Name or God's Name? Most of the time, we care for our name 100 times more than God's Name. When someone says something bad about us, what is our response? We become defensive. When someone slanders us and blackens our names, we want to fight back. We are always protecting ourselves and guarding a good name for ourselves. We want to build a good image to our name. What happens when your boss 'chooses' you above all the other colleagues and 'promotes' you to a higher position? We feel good. We say we deserve the recognition. Slowly and slowly, we become ambitious enough to build a name for ourselves even without our boss. Sad to say, even Christians leaders are climbing up the Tower of Babel to build a name for themselves and do not care about God's Name at all. Who cares for God's Name? Do you? To my shame also, I find that I am only slowly learning to care for God's Name a little bit more as I spend time and energy to write out these blogs for God. 1. David loves God’s Name. 2. David cares for God's Name 100 times more than His own. 3. David wants to MAGNIFY God's Name. 4. David desires God's Name be mangified FOREVER. 5. For sure, David has faith in the EVERLASTING nature of Yahweh's Name. 6. Here, David calls God “Yahweh of hosts. “Hosts” means armies. Yahweh is the King of Israel’s armies, on earth and in heaven. Yahweh's Name lead his armies forward into victory. Do you care for Yahweh's Everlasting Name to be great? If you do not have faith, you will continue on to live for your own name and build up your own name in your family, in your career, among your friends, in your church etc. All these belong to the things of this present age and pass away. 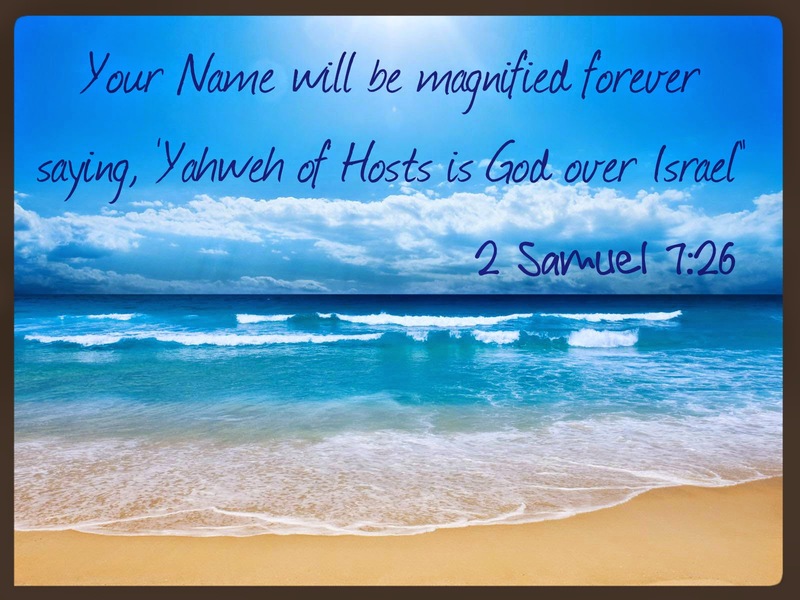 The only thing that lasts forever is for Yahweh's Name be magnified in our lives. This testimony, like David's testimony, can be passed on from generation to generation. Let us have faith and call on Yahweh’s Everlasting Name be magnified in our lives. Our lives will pass away. Only Yahweh's Name continues forever. This will be the last article on this topic #6 - calling on Yahweh's Everlasting Name. First and foremost, we must have FAITH in God's Name and recognize God is Everlasting and His Name is Everlasting. Without 'faith', you can call on God's Name but nothing will happen. With this firm foundation, in our next topic #7, we will move on to "CALLING". In the meantime, drop me a feedback and share with me your thoughts and insights.